This trusted name in kitchen appliances carries its renowned design and construction expertise into this Chef's Classic 12-piece cookware set. Classically styled for any kitchen d��cor, each piece is crafted of 18/10 stainless steel, with an encapsulated aluminum base for quick, even heating without hotspots. The mirror finish never reacts with food or discolors, and maintains its shine even after repeated dishwasher-cleaning. Even the handles and lids are solid stainless steel for the utmost in durability. 12-piece cookware set. The set consists of: 1-1/2-quart covered saucepan; 2-quart covered saucepan; 3-quart covered saucepan; 8-quart covered stockpot; 8-inch skillet; 10-inch skillet; 3-1/2-quart covered saut�� pan. 12 pieces total. Cuisinart's 12-piece Chef's Classic stainless cookware set includes 1-1/2-, 2-, and 3- quart saucepans with covers, 8-inch and 10-inch skillets, a 3.5-quart saute pan with helper and cover, and an 8-quart stockpot with cover. Each piece features 18/10 mirror finish stainless steel which does not discolor, react with food, or alter flavors, and maintains its original brilliant finish with every dishwasher cleanup. Aluminum encapsulated bases heat up quickly, spread heat evenly, and eliminate hot spots. Rims are smoothly tapered to eliminate drips and spills while pouring, and tight-fitting stainless covers seal in moisture and nutrients for healthier, more flavorful results. Oven safe to 550 degrees F, this cookware set is safe for use on the stovetop, in the oven, or under the broiler, and freezer safe for easy storage of leftovers. This is our first stainless cookware purchase after using anodized nonstick aluminum for the last 6 years. We're not professional chefs cooking commercially for tons of people all the time, but the cookware serves us very well for all our family cooking at home. We're not overly concerned about them never having the occasional discoloration, we're more concerned about how they do what they were made for--how they cook. If you're concerned about aesthetics, follow the care instructions enclosed with the packaging, use strictly plastic utensils, and invest in a water softener for your plumbing. Very pleased with the way they cook the food, definitely reduce the heat though as they recommend. At first we had worries that the handles and lids would get really hot since they didn't have silicone or plastic grips. Proved to be a non-issue; the handles don't really heat up at all due to the Y-shaped attachment to the pan, and the lids get warm but not overly so. Even covering boiling water, you can still remove the lids bare handed. This is not a good investment! Fits my Cooking to a T ! This is not my first set of pans. I have had soooo many. I choose these because I want to go from the stove top to the oven...as I call it " without flinching".and these pans fit the bill ! Easy to clean...very light to use.....Thats a good thing--because I already own many cast Iron pots and pans.They are my favorite actually--but they are TOO heavy sometimes. So now I have a set of lighter pans. Many people complained about the handles getting too hot--I haven't found this to be true in my case.....but then...I am not leaving them on the stove all day either. I basically use wooden implements...or the high temp rubber--I do not use any metal utinsels..in these pots......and I told my husband to stay away !!!!! I hand wash them soon after use--I made a pot rack for them to hang from...for both the ability to reach them easily--and to keep them from being scratched. They need lower temps on the stove....so do not burn them. i got this set as a gift for my brother & his new wife. i went to a department store to physically touch it as well as other brands first. It is a great starter set. with normal (3x's/day) daily use this set will last them 10 years easy. it is dishwasher safe, heats evenly, its not Calphalon heavy but unless you have an abusive husband you need to take care of it is more than sufficient. Great product. You must cook on a much lower setting than with teflon pans. It won't stick if you do and the pans clean up fabulously. From my non stick TFAL. I've never had stainless steel before and decided why not, with the great price and online reviews. I am so happy with these!! I provide daycare in my home and cook at least 3 meals a day 5-6 days a week. So I needed something durable, sturdy and cook friendly. They conduct heat evenly in the pan so there are no "cold spots". My stovetop is ceramic and they work well on 3-4 heat setting (low-med low). This was new for me as I had to crank the heat up prior to cook the food well with other pans. When cleaning I follow the recommendations : Soak in soapy water, and presto, they clean themselves. I have had a mild cloudy residue from potatoes, but a little rubbing with Mr Clean Magic eraser and it went away. Plus, it gives me great pleasure to dry these and see the magnificent shine the outside of the pans have. The selection is awesome with this set. A pan for everything. And they transfer from stovetop to oven. I purchased the everyday pan to go along with this set. I am "set" for years !! No more cheap pans, and stinky non stick cookware for me ! I order this set to replace my old tevlon. I really enjoy cooking with them, the pots are not too heavy. They have long handles and clean up well. I had been looking for stainless steel and pricing all the name brands. Amazon had this with free shipping and I decided it was worth a try. 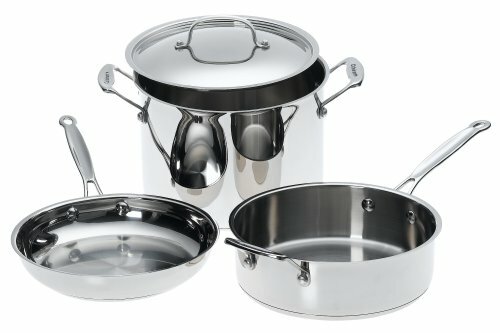 My daughter in law has Capholon stainless and it looks just like my Cuisinart set. I really like my cookware and would recommend it, I use it everyday. It's pretty and functional. It evenly heats and browns the food. I have been looking around for some time now for a good set of stainless steel pots and pans. I finally found this set it the 10 piece version. I had checked it out at the store and loved the way it felt. I was a little unhappy when I went to buy it today and the price had risen $20 since yesterday. I felt it was still a good deal as I was saving over $200. Once it was in my cart, I noticed the 12 piece set was actually cheaper! Best Pans for the Money! I started out with Magnalite aluminum pans as a bride too many years ago. 20 years later those pitted relics went to the Goodwill and were replaced with Calphalon anodized aluminum with non-stick interiors. They lasted perhaps 10 years before the non-stick started to flake off. I wanted stainless steel: dishwasher safe, virtually non-destructable, etc. So, the search began. Revereware, like my mother still uses after almost 60 years, is much more flimsy than it used to be. Farberware? Non-stick or not? One could practically buy a house for the price of the high end stainless, though it is certainly built to last as long. I would occasionally check the houseware stores, Amazon and other websites looking for good, reasonably priced stainless cookware. Imagine my extreme good luck when this cookware came on sale, there was a no shipping deal and $25 off the purchase to boot! I should have bought a lottery ticket that day! The Cuisinart Chef's Classic set showed up in less than a week. I unpacked all the pans and lids, washed them up and put them in the cupboard. All the other pans went the way of the Magnalite. Although the manufacturer says handwashing is best, they go into the dishwasher and come out bright and shiny. Being a creature of habit, I still use SOS scouring pads to remove stains and to polish the metal a bit. The manufacturer does not recommend this, nor do they recommend the use of metal utensils. The saucepans are starting to show wisk marks, but that shows these pans are used and loved. The lids fit well on the saucepans and I don't have boil-overs like I used to have. Do plan on following the instructions relating low heat start-ups; these pans get hot quickly and hold the heat very well. I still use my old, reliable cast iron frying pans for frying foods, but the frying pans and the saute pan are good items to have in the pantry. All the lids are interchangeable according to size. High Quality Cookware, Unbeleivable Deal!